After two years of near-record rainfall across the Kitsap Peninsula, precipitation has returned to a more normal pattern. Halfway through the water year, which begins in October, rainfall in Hansville, Silverdale and Holly are all within 10 percent of the average for this time of year, according to weather instruments managed by Kitsap Public Utility District. 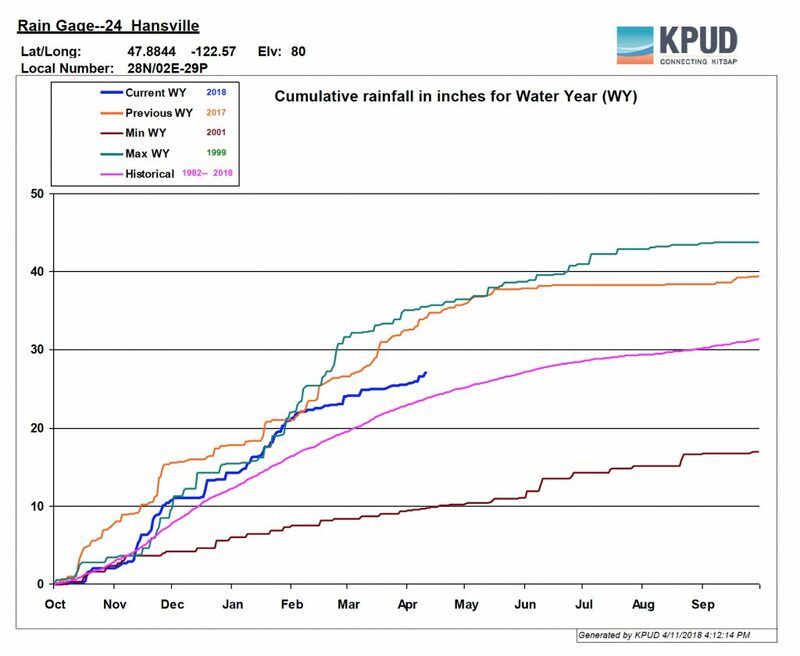 This near-average total for the first half of the year comes about despite a very wet November, when Hansville broke the all-time record for precipitation for that month. Since then, the monthly rainfall numbers have been mostly below average, except for a wet January when Holly nearly broke the record for that month. As we’ve seen time and again, the amount of rainfall decreases dramatically as one travels from south to north on the Kitsap Peninsula. That’s the general pattern for all times of the year, although the amount of precipitation can vary wildly. Hansville received 25.5 inches for the six months ending April 1, compared to a 28-year average of 23.1 inches for that period. Last year, the six-month figure was 7 inches higher at 32.5 inches, and the first half of 2016 went down in the record books with a total of 37.0 inches. 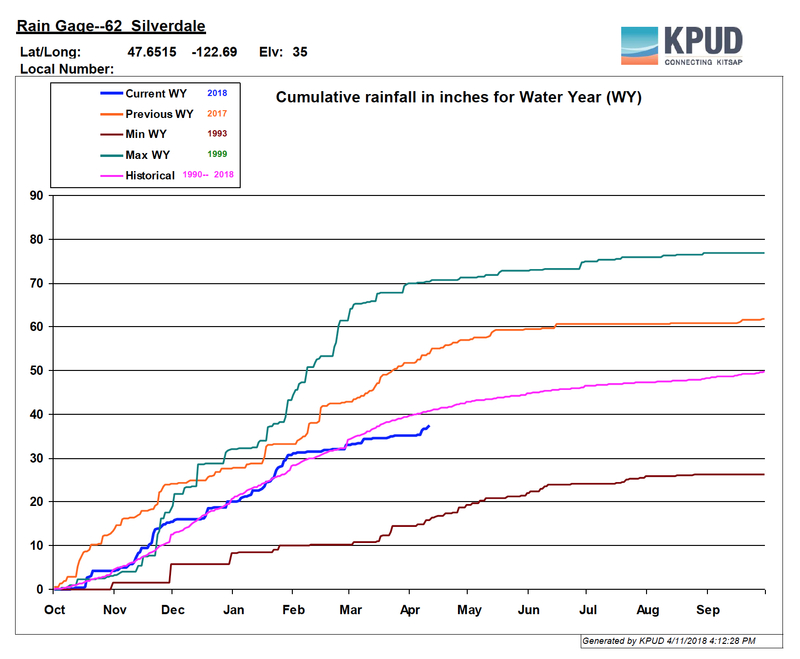 Silverdale posted 35.1 inches of rain by April 1, compared to a 28-year average of 38.1 inches for this time of year. Last year, this Central Kitsap area received 51.7 inches by April, and in 2016 the number was 52.3 inches, second only to 1999 with 69.8 inches. In rainswept Holly, residents experienced 68.7 inches by April 1, compared to a 27-year average of 65.0 inches. By April 1 last year, Holly was practically swimming with 95.9 inches, driven by 24.0 inches during the month of October 2016 and 21.8 inches the next month. 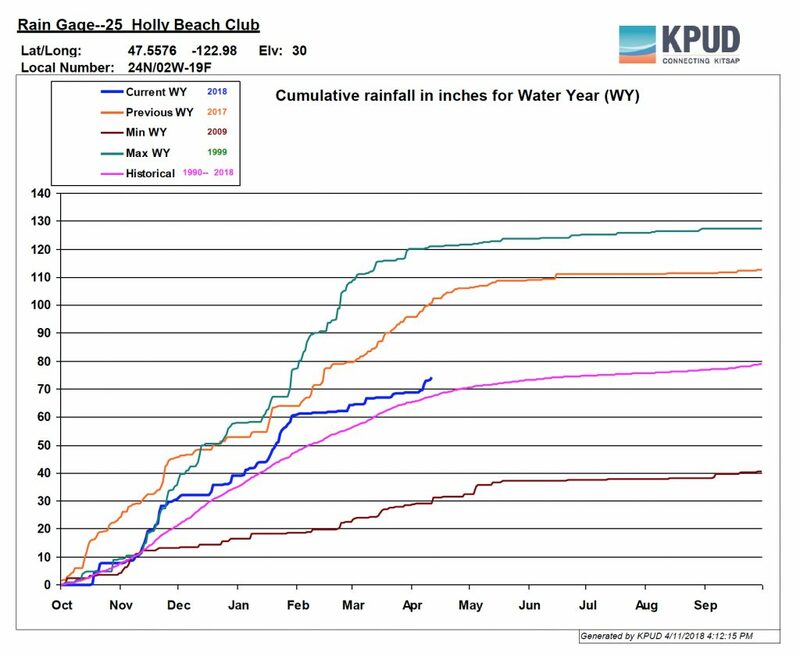 But nothing compares to the first half of water year 1999, when Holly received 120 inches for the first half of the year. Following a fairly dry summer, water year 1999 in Holly ended with 127.5 inches of precipitation. NOAA’s Climate Prediction Center has projected somewhat higher-than-average rainfall through the end of this month in the Pacific Northwest, followed by fairly average conditions going into summer. Forecasters rely heavily on observations about temperatures in the Pacific Ocean, which influence a natural cycle known as the El Niño Southern Oscillation, or ENSO. See video this page. A very strong El Niño during 2015 and 2016 (associated with the much-discussed “blob”) shifted into a weak La Niña in 2017. Conditions have now reversed course again and seem to be headed toward neutral. La Niñas are generally associated with cooler and wetter weather for our region of the country, while El Niños suggest warmer and dryer conditions — although it does not always turn out that way. Neutral conditions are expected to arrive by summer, and some forecasters predict that the warmer El Niño could arrive toward the end of the water year in September, according to information released today by the Climate Prediction Center. “Some of the computer models are forecasting development of El Niño by next fall,” noted research scientist Emily Becker in a new post on the ENSO Blog, “but there are a number of reasons why we’re not completely taking the bait right now. Researchers observed a warming trend in March among subsurface waters in the Eastern Pacific. Those waters are expected to rise to the surface over the next few months to potentially neutralize any cool surface waters that remain. The outcome is likely to be the end of the current La Niña and possibly the beginning of a new El Niño, featuring warmer ocean conditions.